0) IBM Bluemix is an app-cloud, similiar to Heroku, deployed with CloudFoundry on their own cloud infrastructure. No need for gradle/exec builder wrapper. 3) Do not forget to include manifest.yml to your project. Yes, Bluemix could be more verbose about the fact that this file is missing / it has no idea what is where and how it should be deployed. 3) Check dashboard logs - it doesn't help to starve your scala app with too low memory (mine got ok when I increased mem from 128 to 512, even if 512 was already an upper limit when started with 128). 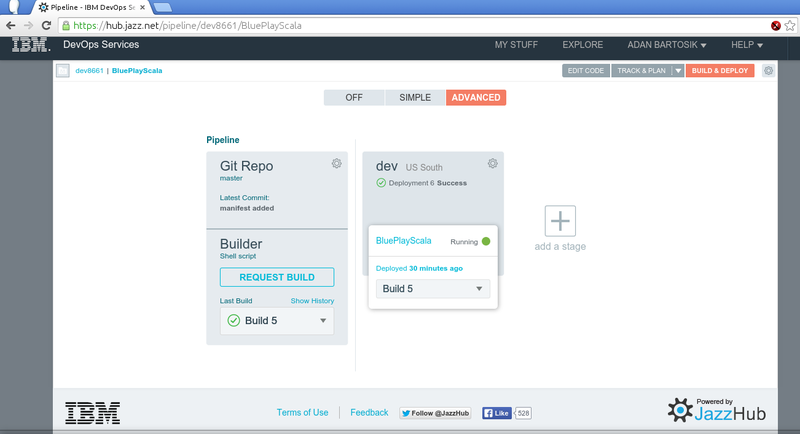 4) I like pipelines - build/CI infrastructure. This is how you can pack complex tasks into one clean overview. 5) Thanks for all cooperation during last Krk Scala hack-meetup - it was worth to attend and "get something done".